Visually impaired people can often find it challenging to shop in a supermarket on their own since most of the information on products is provided visually. This conceptual product from Hansub Lee would enable visually impaired shoppers to get instant information on any product with a bar code. 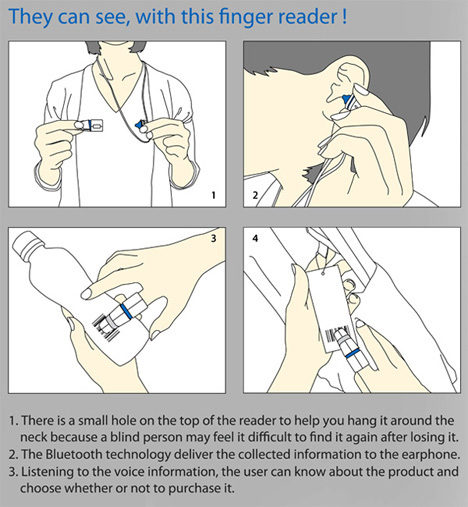 The Finger Reader consists of two pieces: a tube-like piece which fits over the finger and a Bluetooth earpiece. 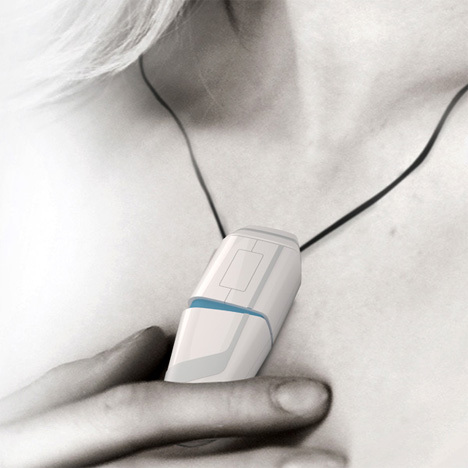 The finger piece contains a scanner in the tip which can be run over any bar code for information on the product it represents. 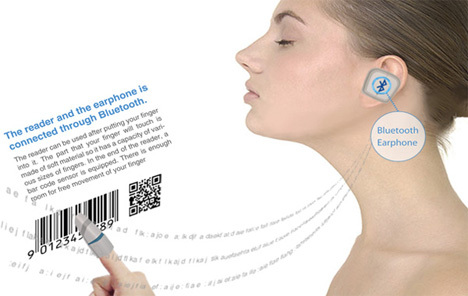 The information is transferred into audio and spoken in the user’s ear by the earpiece. Easy peasy, the blind shopper now has information on every product with a package. The only problem that the designer seems to have overlooked is the fact that bar codes are often difficult to find even for those of us who can see them. If you’ve ever tried to check out your own groceries at the self check-out stands in the supermarket, you know this frustration. Unless the user is expected to run his or her finger over every inch of every single package in the store, the invention wouldn’t quite work. Besides which, simply finding an item that one is interested in often takes a fair amount of hunting through seemingly endless aisles. What might work more efficiently is a system of RFID tags embedded in each product and a guidance infrastructure – sort of like a shopping GPS – in the store. Helping visually impaired people to become more independent and complete daily tasks on their own is a wonderful goal, but designers first need to consider the limitations of their proposed technology. See more in Unbuilt Concepts or under Technology. September, 2011.